The New York Knicks had a great draft in 2018, on paper. The team had a lottery pick and selected Kentucky’s Kevin Knox with the ninth pick. In the second round, the Knicks chose Mitchell Robinson with the 36th pick out of Chalmette High School in Louisiana. At the beginning of the season, it appeared that Knox was the better pick. Robinson was battling an ankle injury, but Knox just seemed more fluid. Robinson did not play competitive basketball in a year while training for the draft. However, the roles have been reversed. Robinson appears to be the better pick as Knox struggled mightily in the second half of the season. Everyone knew that Robinson has potential and fans have been given the pleasure of seeing what Robinson is capable of. Robinson has been killing it on the glass and blocking shots, basically all season. He capped it off with that 21 rebound game against the Raptors on March 28th. Robinson has also been shooting 69% from the field for the seaosn. I know, it has all been alley-oops have buckets around the hoop, but you need a player that can be automatic around the rim. The potential is there and we see it. I can only imagine once Robinson continues to bulk up, gain even more confidence and develop under Fizdale. He can be a serious problem in the East. He’ll be a much better Clint Capela. Knox started off the season, I mean the summer league looking like the next NBA sensation. In the summer league, he was playing with confidence and looked unstoppable. Then, the ankle injured occurred. The injury seemed to slow his confidence and development. Knox has shown glimpses throughout the rollercoaster season of his potential as well. He can shoot, needs a lot of work, drive, and jump. Defense needs a lot of work also. Knox has had spurts of showing and gaining confidence in his production and then it seemed to tail off. The main concerned despite his lackadaisical defense is his shooting percentage. When you look at his stat sheet, it appears that Knox can score points, which rightfully so. But, when you look at his stat sheet, his field goals and attempts is cringe-worthy. Knox is only shooting 37% from the field on the season. I don’t know if it’s just me, but it always seems like Knox shoots 3-12, 6-15 or 8-17 from the field. That is not the type of production you want out of a lottery pick. Fizdale needs to do some heavy shooting exercises with Knox on the off-season to boost that confidence. Both players have a lot of potentials. We have seen it from both, but more so Robinson. The season has been a downhill rollercoaster for the most part, but most fans can all agree on one thing. 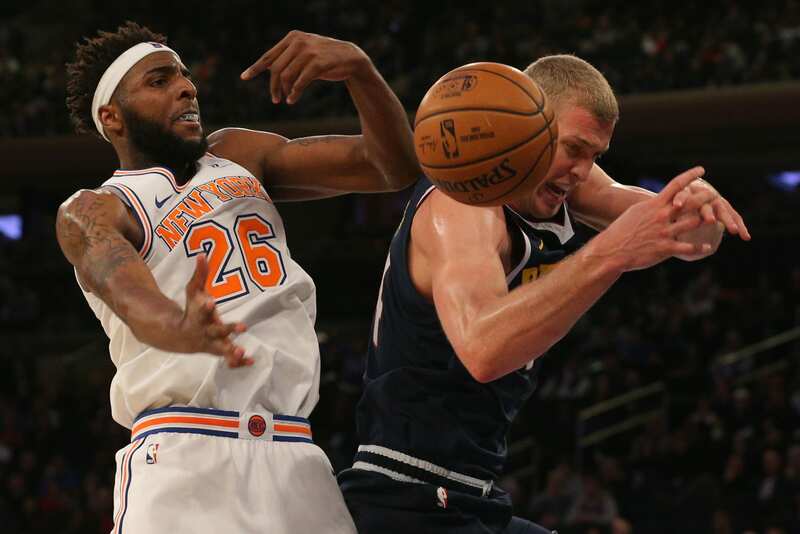 Mitchell Robinson has been the bright spot for the Knicks this season, not Kevin Knox.